Since Google removed the Google Apps billing API in April 2013, we have been operating the service without income. We explored many ways to re-integrate with the marketplace since then, but it has become apparent that it isn’t meant to be. You can request a full backup of your wiki any time between now and December 1st. We are truly sorry for the inconvenience and will do our best to answer any questions you have. Many of you have requested breadcrumbs for your articles in WikiFYD. Friday we added breadcrumbs to your sub-pages. When you have two articles like “Example” and “Example/Details” the latter will contain a link to the former. This holds for multiple levels of sub-pages and is handled automatically. Also in this recent update, we enabled email notifications for discussions on articles in your watch list. This has always been an option, but now it is the default for everyone who hasn’t changed it. This should make it easier to keep up-to-date on what is happening within your wiki. Please don’t hesitate to contact us if you have any questions or suggestions! 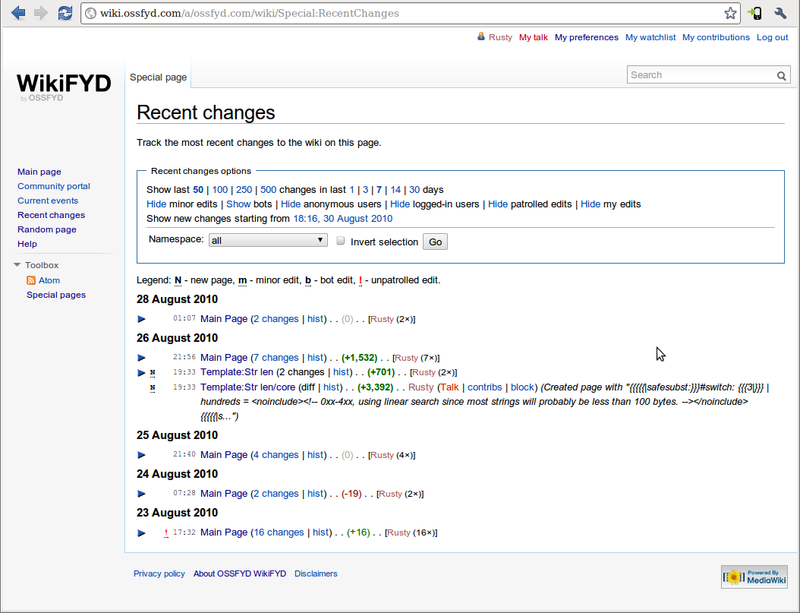 A new extension is available for use with WikiFYD. Have you ever needed a few one-off styles for a wiki article? This new extension allows you to add CSS rules to any article. As always, if you have any questions, don’t hesitate to contact us! If you have a wiki article called “Projects/CSS”, which includes styles intended for use with the article “Projects”, you would add the following wiki markup to the latter. CSS rules can also be included directly within the target wiki article (inline). We are excited to announce, SSL is now enforced for all our services (including WikiFYD). If you have old links to HTTP pages, they will automatically redirect to the HTTPS version. This is another step to further strengthen our commitment to your privacy and security. In other news, we updated WikiFYD yesterday to automatically use any custom image you specify on your Google Apps control panel instead of our logo. Go check it out! As always, please do not hesitate to contact us if you have any questions, suggestions or issues. You may have noticed a couple major security issues in PHP and MediaWiki were announced over the past couple weeks. While it is not normally our policy to bug you about every update we make, we want you to know that WikiFYD was updated promptly after these issues were announced and continues to be safe for you and your organization. Our goals for our services include “worry-free” and we hope you find this to be the case. As always, if you have any questions, please do not hesitate to contact us! So great, you have your wiki all setup. How do you keep track of what is going on? Too much information? Try using your watchlist. To use your watchlist, click the star next to the search box on each page you wish to watch. The first time a change is made to each page you will get an email. No other setup necessary! Don’t worry about tons of email because you won’t be notified again until after you have visited the page. What other tips and tricks do you use for keeping up-to-date? Let us know in the comments below! Sorry, this post is obsolete now that we are using the new Google Apps Billing API. We will post a replacement soon. Getting setup with WikiFYD is super simple. Start off by visiting our Google Marketplace listing. 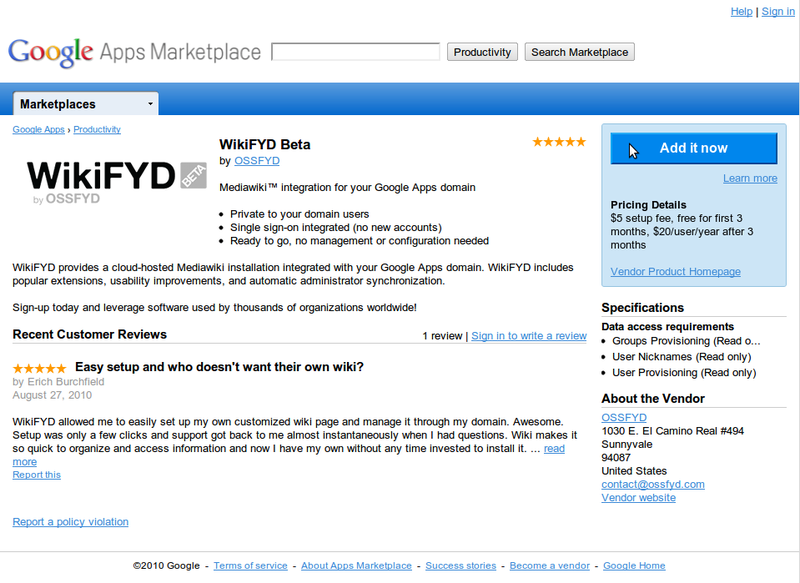 After clicking the blue button you will need to enter your Google Apps domain name and click “Go”.